This page refers to Portfolio classic plans. If you are currently running Portfolio 2.0, please check this link to access the latest page version. Select your plan and go to People > Configure stages & skills. Choose a team member and click details. 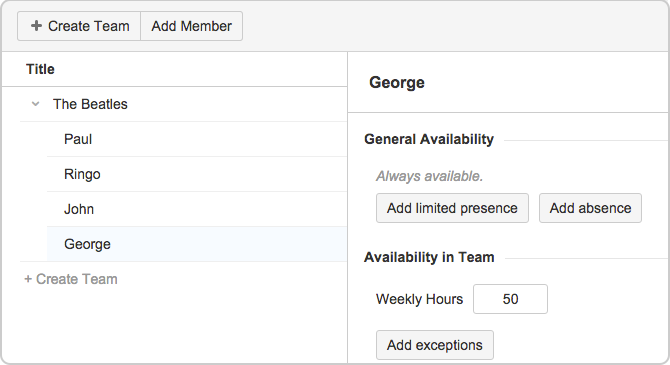 Configure a Limited Availability for example, when a team member is working only part time. You can select as many intervals as you need. Add absences intervals for team's members who are on some sort of leave such as vacations, parental leave or trainings. The configuration of absences, presences, and availability applies only within a single plan,and is not shared across plans. In instances where one team member is working for different teams, and these teams are defined in different plans, you will need to model this configuration in both plans separately. You can configure the Availability in Team to set a person's availability within different teams. For example, a team member can work for 20 hours a week for project team X, and for another 15 hours for project team Z. You can also configure the time that a person will work in different projects by selecting the team member and clicking Add exceptions. For example, you want George to join the Professionals team for 20 hours a week in July. You create an exception for George in the 'The Beatles' team and set 20 hours availability with that team throughout July. Add George to 'The Professions', with a general availability of 0 (as he normally does not work there), and the same exception as depicted below with the 20 hours/week in July.